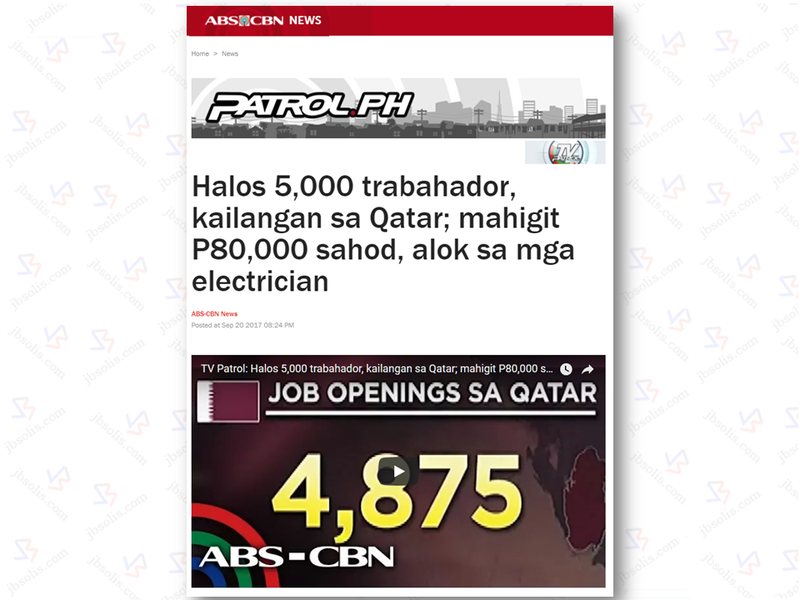 About 5,000 jobs are now available for OFW jobseekers in Qatar according to Philippine Overseas Employment Administration. POEA said that Qatar's economy is remain unfazed in spite of their neighboring GCC countries severance of ties with them. In fact, their infrastructure and construction sector is in great demand of workers. And more other jobs that according to the POEA website, if summed up will be almost 5,000. For welders and other construction jobs, the initial salary is QR1,700 or around P23,000. It more than P80,000 or QR6,000 for engineers and electricians. Still the most in demand job are nurses with salary of QR3,200 or P40,000 and up. According to POEA, Qatar has continuing demand of foreign workers including OFWs to meet the construction demands for their projects related to being the host of FIFA World Cup on 2022. However, the diplomatic crisis between Qatar and other GCC countries creates doubts that the projects will not push through as the conflict is still remains unresolved. However, Qatar said their self sufficiency has been tested and proven due to the diplomatic crisis. POEA advised the applicants that they do not need to go personally to their offices for qatar jobs. All the details about the jobs including the accredited agencies can be found in their official website. *For the list of the POEA accredited and licensed land-based recruitment agencies, watch the video below.